The day I went to see them open the bridge was the day I realized I’d never escape 1940. Or at least, wouldn’t escape it in any way but the normal byway into 1941 and subsequently the war and 1942 and beyond. I’d never see 2006 again, not for a long, long time. After Mary Sue flung her chubby little hand out toward the dashboard, slapping open the glove box and breaking the fragile plastic tube that kept the Ununhexium inert and in this dimension, I felt the dread certainty of a man marooned. Don’t fool around with the local talent, crazy Uncle Waldo used to tell me. They called him crazy because before he married my aunt he claimed to be from the next century. From the 2000s. He got back there all right. A grey-haired curmudgeon with a tinkerer’s hand and pied piper’s skill at entrancing his little nephews. Local talent. Sheesh. I’d have to adopt a crazy Austrian accent too, pronounce the first letter of my name as a V instead of a W. Hmm, maybe I’d wait another five to six years first. 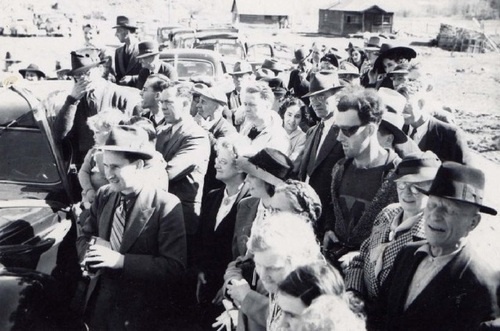 I’m really into stories of time travelers caught in image. I might write a book of their stories one day. If you see any – send them to me! Also, in microfiction: Robin Sloan’s new volcanic brainstorm: Ash Cloud Tales.